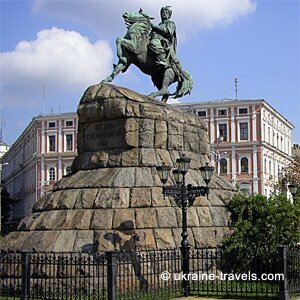 Ukraine, travels, history, economy, culture and traditions. 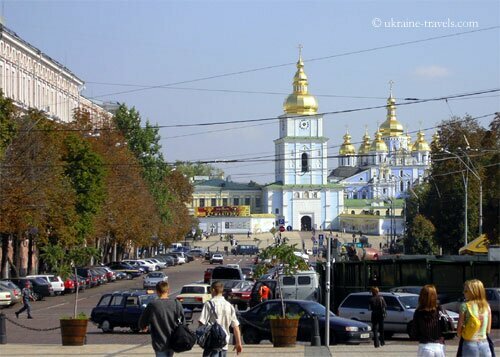 Symbol images of the Ukraine, in the capital Kiev, the view of Sofievskaija Square with a monument to Bogdan Hmelnitskiy precursor of the national unity and at the bottom of the page the famous Mihajlovskaja Orthodox Church. These pages are to help those, for motives like tourism, work or love, in their search of organising a journey to the Ukraine. The trip will be certainly fascinating; the cities are beautiful and rich in history, impressive monuments and many of these praise the Soviet Union. Whoever visits the city of Kiev, do not realise that they are in the Ukraine. The city smells of European style from the traffic to consumerism but its character is genuine and true, due to the Ukrainian habitants with their native sense of hospitality. The food is good, perhaps a small cake, high calorie but genuine. Don't look for Italian or International dishes, from the Ukraine kitchen you have unique tastes, very flavoursome that you will certainly remember other than the really convenient cost. 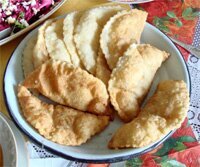 The taste and recipes maintains itself in the whole territory, you will find a few variants in the south where, in certain areas, prevails the tartare kitchen, Cibureki, a Ukrainian dish as on the Ai-Petry plateau in Crimea. For more information refer to the page Ukraine kitchen. The traditional drink carries the name Kompot and is treated by an infusion of dried fruit with a particular process. This drink is prepared at home and you can not find it commercially, the taste is very light and does not distinguish itself with a definite taste but is genuine and good if drank fresh. The colour is lightly roasted. If you drink, Ukrainian beer has a taste very similar to European and Coca-Cola by now a worldwide drink. Wine is little consumed. In the Ukraine it is only produced in the Crimea and has a taste different to Italian, sweeter and more like Marsala. We can classify it as a dessert wine but don't avoid it, in fact it has the same typical unique character, like another wine imported from Georgia. If you want to taste a wine quite fruity and similar to Italian, we advise the Merlot produced by the Massandra cellars, besides it is distributed in the supermarkets at accessible prices (20/25 grivne). To describe a grand nation like the Ukraine and besides showing how to travel in cities like Leopoli (Lviv or L'viv) or Kharkiv (kharkov) or Sumy and perhaps Odesa, it is a difficult task and not always easy to be comprehensive. These pages already rich in content and information, are continuingly being developed and, if you cannot find the answer to your question, enter in the Contacts Form of Ukraine Travel, we can make it possible to satisfy you.